"Down Under" is a song recorded by Australian rock band Men at Work. It was originally released in 1980 as the B-side to their first local single titled "Keypunch Operator", released before the band signed with Columbia Records. Both early songs were written by the group's co-founders, Colin Hay and Ron Strykert. The early version of "Down Under" has a slightly different tempo and arrangement from the later Columbia release. The most well known version was then released on Columbia in 1981 as the third single from their debut album Business as Usual (1981). The hit song went to number one in their home country of Australia in December 1981, and then topped the New Zealand charts in February 1982. The song topped the Canadian charts in October 1982. In the United States, the song debuted on the Billboard Hot 100 on 6 November 1982 at No. 79, and reached No. 1 in January 1983 where it spent four non-consecutive weeks. It eventually sold over two million copies in the US alone. Billboard ranked it at No. 4 for 1983. In the UK, the song topped the charts in January and February 1983, and is the only Men at Work song to make the UK top 20. The song also went to No. 1 in Denmark, Ireland, Italy and Switzerland, and was a top 10 hit in many other countries. "Down Under" is perceived as a patriotic song in Australia; it remains popular and is often played at sporting events. The lyrics to Down Under depict an Australian man travelling the globe, who meets people who are interested in his home country. The story is based in part on singer Colin Hay's own experiences, including a prominent reference to a Vegemite sandwich (a popular snack in Australia), which derived from an encounter, during Hay's travels abroad, with a baker who emigrated from Brunswick, Melbourne. Hay has also said that the lyrics were partly inspired by Barry Humphries' character Barry McKenzie, a comically stereotypical Australian who tours abroad. Slang and drug terms are featured in the lyrics. They open with the singer travelling in a fried-out Kombi, on a hippie trail, head full of zombie. In Australian slang "fried-out" means overheated, "Kombi" refers to the Volkswagen Type 2 combination van, and having "a head full of zombie" refers to the use of a type of marijuana. "Hippie trail" refers to a subcultural tourist route popular in 1960s and 70s which stretched from Western Europe to South-East Asia. The song also contains the refrain, where beer does flow and men chunder. To "chunder" means to vomit. The chorus is really about the selling of Australia in many ways, the overdevelopment of the country. It was a song about the loss of spirit in that country. It's really about the plundering of the country by greedy people. It is ultimately about celebrating the country, but not in a nationalistic way and not in a flag-waving sense. It's really more than that. The promotional video comically plays out the events of the lyrics, showing Hay and other members of the band riding in a VW van, eating muesli with a 'strange lady', eating and drinking in a café, and lying in an opium den. The band are moved along at one point by a man in a shirt and tie who places a 'Sold' sign in the ground. The exterior shots for the music video were filmed at the Cronulla sand dunes in Sydney. The band are seen carrying a coffin across the dunes at the end. This, Hay has explained, was a warning to his fellow Australians that their country's identity was dying as a result of overdevelopment and Americanization. Hay has also stated that the same ominous sentiment lies behind the choral line, Can't you hear that thunder? You'd better run; you'd better take cover. The song is a perennial favourite on Australian radio and television, and topped the charts in the US and UK simultaneously in early 1983. It was later used as a theme song by the crew of Australia II in their successful bid to win the America's Cup in 1983, and a remixed version appears during the closing credits of Crocodile Dundee in Los Angeles. Men at Work played this song in the closing ceremony of the 2000 Summer Olympics in Sydney, alongside other Australian artists. In May 2001, Australasian Performing Right Association (APRA) celebrated its 75th anniversary by naming the Best Australian Songs between 1926 and 2001, as decided by a 100 strong industry panel, "Down Under" was ranked as the fourth song on the list. The song was ranked number 96 on VH1's 100 Greatest Songs of the 1980s in October 2006. In 2007, on the ABC-TV quiz show Spicks and Specks the question was posed "What children's song is contained in the song Down Under?" The answer, "Kookaburra", a song whose rights were owned by Larrikin Music, resulted in phone calls and emails to Larrikin the next day. Larrikin Music subsequently decided to take legal action against the song's writers Colin Hay and Ron Strykert. Sections of the flute part of the recording of the song were found to be based on "Kookaburra", written in 1932 by Marion Sinclair. Sinclair died in 1988 and the rights to the Kookaburra song were deemed to have been transferred to publisher Larrikin Music on 21 March 1990. In the United States, the rights are administered by Music Sales Corporation in New York City. In June 2009, 28 years after the release of the recording, Larrikin Music sued Men At Work for copyright infringement, alleging that part of the flute riff of "Down Under" was copied from "Kookaburra". The counsel for the band's record label and publishing company (Sony BMG Music Entertainment and EMI Songs Australia) claimed that, based on the agreement under which the song was written, the copyright was actually held by the Girl Guides Association. On 30 July, Justice Peter Jacobson of the Federal Court of Australia made a preliminary ruling that Larrikin did own copyright on the song, but the issue of whether or not Hay and Strykert had plagiarised the riff was set aside to be determined at a later date. On 4 February 2010, Justice Jacobson ruled that Larrikin's copyright had been infringed because "Down Under" reproduced "a substantial part of Kookaburra". When asked how much Larrikin would be seeking in damages, Larrikin's lawyer Adam Simpson replied: "anything from what we've claimed, which is between 40 and 60 per cent, and what they suggest, which is considerably less." In court, Larrikin's principal Norman Lurie gave the opinion that, had the parties negotiated a licence at the outset as willing parties, the royalties would have been between 25 and 50 per cent. On 6 July 2010, Justice Jacobson handed down a decision that Larrikin receive 5% of royalties from 2002. In October 2011, the band lost its final court bid when the High Court of Australia refused to hear an appeal. Until this high-profile case, "Kookaburra"'s standing as a traditional song combined with the lack of visible policing of the song's rights by its composer had led to the general public perception that the song was within the public domain. The revelation of "Kookaburra"'s copyright status, and more so the pursuit of royalties from it, has generated a negative response among sections of the Australian public. In response to unsourced speculation of a Welsh connection, Dr Rhidian Griffiths pointed out that the Welsh words to the tune were published in 1989 and musicologist Phyllis Kinney stated neither the song's metre nor its lines were typical Welsh. Colin Hay has since suggested that the deaths of his father, Jim, in 2010, and of Men at Work flautist Greg Ham in 2012 were directly linked to the stress of the court case. A new version of the song was produced by Colin Hay, coinciding with the thirtieth anniversary of the original's release. Requested by Telstra for use in an Australian advertising campaign during the 2012 Summer Olympics period, the song was available through iTunes on 31 July. In the new version, Hay intentionally changed the flute part that caused the copyright lawsuit. ^ Parker, Lyndsey (4 February 2010). "Men At Work vs. The Man: '80s Band Charged With Plagiarism". Yahoo! Music. Archived from the original on 15 July 2014. ^ Reed, Ryan (2 March 2011). "Colin Hay Is Still at Work, 25 Years After 'Down Under'". Metro Pulse. Archived from the original on 15 March 2011. ^ McFarlane, Ian (1999). "Encyclopedia entry for 'Men at Work'". Encyclopedia of Australian Rock and Pop. Allen & Unwin. ISBN 1-86448-768-2. ^ a b "Top 100 Hits for 1983". The Longbored Surfer. Retrieved 10 June 2014. ^ "Men at Work". Official Charts Company. Retrieved 9 February 2012. ^ a b c d e "Down Under-covered". BBC News Online. 1 August 2009. Retrieved 10 June 2014. ^ Malkin, Bonnie (30 July 2009). "Men at Work sued over 'stolen' riff in Down Under". The Daily Telegraph. Retrieved 13 December 2017. ^ a b "Down Under by Men at Work". Songfacts. Retrieved 11 February 2010. ^ "Men at Work's Colin Hay on Friday Night Videos intro for Down Under". YouTube. ^ Erlewine, Stephen Thomas. "Men at Work – Artist Biography". AllMusic. Retrieved 7 July 2010. second American number one early in 1983 and it became the band's first British hit single; the song reached number one in both countries simultaneously. ^ Shears, Richard (5 February 2010). "Men At Work face £33m bill after judge rules Australian band copied Down Under melody". Daily Mail. London. Retrieved 24 January 2011. ^ "Men At Work lose plagiarism case". BBC News Online. 4 February 2010. Retrieved 7 July 2010. ^ "The final list: APRA'S Ten best Australian Songs". Archived from the original on 8 March 2008. . Australasian Performing Right Association. 28 May 2001. ^ "The Greatest » Ep. 167 "100 Greatest Songs of the 80s (Hour 1)"". Archived from the original on 10 December 2011. . VH1. ^ "Down Under and Kookaburra in copyright battle". News.com.au. 12 October 2009. Retrieved 12 October 2012. ^ Larrikin Music Publishing Pty Ltd v EMI Songs Australia Pty Limited  FCA 799, Federal Court (Australia). ^ Davies, Lisa (25 June 2009). "Claims Men At Work hit Down Under is a rip-off of Kookaburra song". News.com.au. Retrieved 7 July 2010. claiming Larrikin doesn't actually have copyright to Kookaburra – the Girl Guides do. ^ Hohenboken, Angus (25 June 2009). "Girls may have guided Men at Work's song Down Under". The Australian. ^ "Men At Work face plagiarism case". BBC News Online. 30 July 2009. ^ Larrikin Music Publishing Pty Ltd v EMI Songs Australia Pty Limited  FCA 29, Federal Court (Australia). ^ Dingle, Sarah (4 February 2010). "Men at Work plundered Kookaburra riff: court". ABC News. ^ a b Larrikin Music Publishing Pty Ltd v EMI Songs Australia Pty Limited (No 2)  FCA 698 at para. 45, Federal Court (Australia). ^ "Men at Work lose appeal over Kookaburra riff". The Guardian. London. Associated Press in Sydney. 7 October 2011. Retrieved 9 October 2011. ^ Ham, Larissa; Arlington, Kim (5 February 2010). "Kookaburra case: publisher hits back at Colin Hay's "greed" claim – Music". The Age. Melbourne. Retrieved 27 April 2010. ^ a b "Origins: Kookaburra – possible copyright info". Mudcat Café. Retrieved 27 April 2010. ^ "Men at Work steal children's song..." Forums.whirlpool.net.au. Retrieved 27 April 2010. ^ Ulaby, Neda (1 December 2009). "A Kookaburra Causes Trouble 'Down Under'". NPR Music. Retrieved 27 April 2010. number of Australians, including Westwood, found this a bit much. ^ Adams, Cameron (10 August 2015). "Men at Work's Colin Hay says Down Under lawsuit 'contributed' to death of his dad and bandmate". news.com.au. Retrieved 13 December 2017. ^ Hardie, Giles (27 July 2012). "Down Under loses its infringing flute". Sydney Morning Herald. Retrieved 27 July 2012. ^ "Colin Hay to Celebrate 'Down Under' 30th Anniversary with Global Re-Release". Colinhay.com. 24 July 2012. Retrieved 27 July 2012. ^ Henschke, Ian. "Colin Hay and Down Under 2012". Retrieved 27 July 2012. ^ "Australia No. 1 hits -- 1980's". World Charts. Archived from the original on 20 May 2011. Retrieved 9 June 2013. ^ "Ultratop.be – Men At Work – Down Under" (in Dutch). Ultratop 50. Retrieved 10 June 2014. ^ "Top RPM Singles: Issue 6942." RPM. Library and Archives Canada. Retrieved 1 June 2013. ^ "Le Détail par Artiste" (in French). InfoDisc. Select "Men at Work" from the artist drop-down menu. Retrieved 15 May 2016. ^ "Offiziellecharts.de – Men At Work – Down Under". GfK Entertainment Charts. Retrieved 10 June 2014. ^ "The Irish Charts – Search Results – Down Under". Irish Singles Chart. Retrieved 1 June 2013. ^ "Nederlandse Top 40 – Men At Work - Down Under" (in Dutch). Dutch Top 40. Retrieved 10 June 2014. ^ "Dutchcharts.nl – Men At Work – Down Under" (in Dutch). Single Top 100. Retrieved 10 June 2014. ^ "Charts.nz – Men At Work – Down Under". Top 40 Singles. Retrieved 10 June 2014. 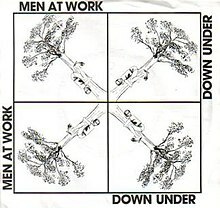 ^ "Norwegiancharts.com – Men At Work – Down Under". VG-lista. Retrieved 10 June 2014. ^ "South African Rock Lists Website SA Charts 1969 – 1989 Acts (M)". Rock.co.za. Retrieved 1 June 2013. ^ "Swedishcharts.com – Men At Work – Down Under". Singles Top 100. Retrieved 10 June 2014. ^ "Swisscharts.com – Men At Work – Down Under". Swiss Singles Chart. Retrieved 10 June 2014. ^ a b c d "Business as Usual – Awards". AllMusic. Retrieved 1 June 2013. ^ "CASH BOX Top 100 Singles – Week ending JANUARY 22, 1983". Cash Box. Archived from the original on 11 September 2012. ^ "Listy bestsellerów, wyróżnienia :: Związek Producentów Audio-Video". Polish Airplay Top 100. Retrieved 8 January 2018. ^ a b "Forum – ARIA Charts: Special Occasion Charts – Top 100 End of Year AMR Charts – 1980s". Australian-charts.com. Hung Medien. Archived from the original on 6 October 2014. Retrieved 10 June 2014. ^ "Jaaroverzichten 1982" (in Dutch). Ultratop. Hung Medien. Retrieved 10 June 2014. ^ "Top 100 Singles of 1982". RPM. Vol. 37 no. 19. 25 December 1982. Retrieved 15 May 2016. ^ "Top 100-Jaaroverzicht van 1982" (in Dutch). Dutch Top 40. Retrieved 15 May 2016. ^ "Jaaroverzichten – Single 1982" (in Dutch). Single Top 100. Hung Medien. Retrieved 10 June 2014. ^ "End of Year Charts 1982". Recorded Music New Zealand. Retrieved 25 April 2016. ^ "Top 20 Hit Singles of 1982". Rock.co.za. Retrieved 10 June 2014. ^ "Schweizer Jahreshitparade 1982" (in German). Hitparade.ch. Hung Medien. Retrieved 10 June 2014. ^ "Chart Archive – 1980s Singles". everyHit.com. Retrieved 10 June 2014. ^ "The CASH BOX Year-End Charts: 1983". Archived from the original on 11 September 2012. . Cash Box magazine. ^ "Hot 100 Turns 60". Billboard. Retrieved 5 January 2018. ^ "Canadian single certifications – Men at Work – Down Under". Music Canada. ^ "British single certifications – Men at Work – Down Under". British Phonographic Industry. Select singles in the Format field. Select Gold in the Certification field. Type Down Under in the "Search BPI Awards" field and then press Enter. ^ "American single certifications – Men at Work – Down Under". Recording Industry Association of America. If necessary, click Advanced, then click Format, then select Single, then click SEARCH.